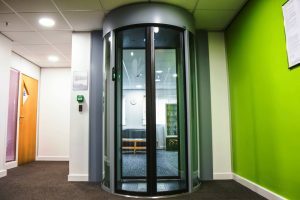 PRODUCT: E1 & FPJ140 2S Security Portals SECTOR: Data Centre CLIENT: TalkTalk LOCATION: Manchester & Birmingham TalkTalk is one of the UK’s leading consumer and business to business telecom providers, supplying over 4 million customers with landline, broadband, TV and mobile packages. Their success has been driven by their mission to deliver affordable, reliable, simple and fair services for everyone. To support TalkTalk’s continued growth and ensure they are able to offer the best possible service to their customers. TalkTalk operate a number of data centres nationwide to manage their own internal networks and IT requirements. 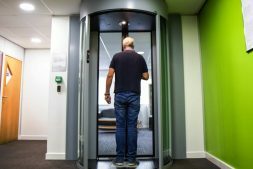 In order to ensure that data is secure TalkTalk have implemented robust security measures with several layers of physical security, from perimeter fencing and manned access gates to internal access controlled doors. 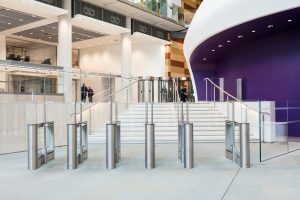 To prevent unauthorised users accessing the data halls and offices, TalkTalk needed a physical security solution that could detect and prevent tailgating attempts. With years of experience supplying Anti-tailgating solutions to the data centre market, Meesons were approached to provide effective tailgating solutions at three of TalkTalk’s data centres. A solution was required that would provide access to authorised personnel whilst preventing tailgating attempts. Meesons therefore proposed the installation of a security portal at each of the sites allowing the access of only authorised personnel. To ensure no tailgating attempts would be possible each portal was fitted with anti-tailgating sensors, preventing more than one user transiting at a time. For added security each portal was fitted with a two-zone pressure mat to provide an extra verification parameter to the tailgating detection. 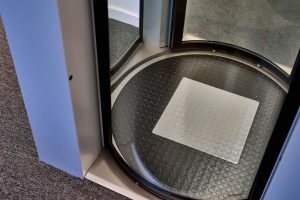 The two-zone pressure mat requires users to stand on the grey square during the verification process. 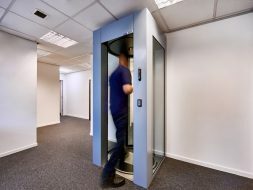 After attending the sites to carry out surveys and assessing the locations where the portals were required, Meesons advised on the installation of two E1 security portals and an FPJ140 2S security portal. A key challenge faced during the project was building access to the required locations and fitting of the portals within the existing openings. 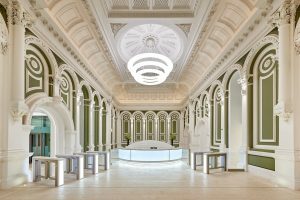 Due to each of the security portals modular kit based designs the portals were able to be taken into the building in sections and assembled in the space required. 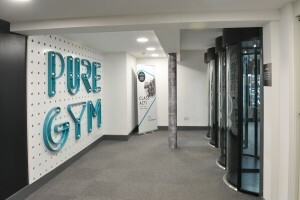 This enabled the portals to be retrofit in to the tightest of spaces with minimal disruption. 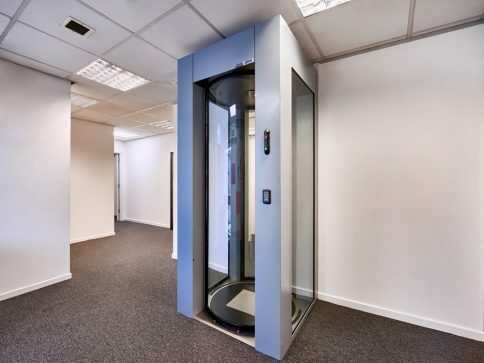 One of the sites required the installation of a security portal into a narrow corridor, due to the limited space Meesons proposed the E1 Security Portal, its compact design fitted perfectly ensuring the corridor could be secured and prevent unauthorised access. 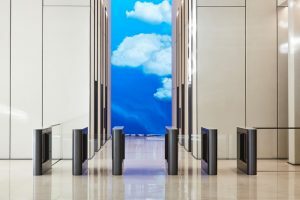 Following the successful completion of the installation, Meesons were appointed to oversee the service and maintenance of the security portals.